In the glorious year 2039, not only has North America (minus the bits south of Mexico) been unified under one government, but the North American Union extends into space itself, owning colonies as far from Earth as the asteroid belt. 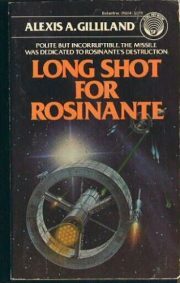 The space colony called Rosinante is merely one among many such asteroid communities. One among too many, as it turns out. And all it takes to start a savage market correction is a series of short-sighted, self-serving decisions by a rich cast of idiots on Earth, from Texas’ idiot governor, bankers who should have known better, and a coterie of Japanese businessmen more swayed by bigotry than fiscal prudence. One economic contraction later and space contractor Charles Cantrell finds himself the dubious co-owner of an uncompleted space colony whose population consists of unhappy Texan college students, a small army of Korean-Japanese women, and a workforce unhappy to learn that they won’t be getting paid. The forces that mandated the creation of the North American Union in 2004 were powerful but short lived. The Forbes administration is all too aware that the main things holding the NAU together in 2039 are inertia and the efforts of the secret police. Unfortunately for a lot people, not only has the administration lost sight of the difference between preserving the NAU and preserving their hold on office, but the Creationist Coalition behind President Forbes has its roots in the Contra Darwin, and while that organization is long gone, it was only because so many of its members pulled off a lateral move into Stanley Bowman’s NAUGA-Security. For reasons that are completely opaque to Cantrell, NAUGA-Security has convinced itself that Cantrell is somehow an enemy of the state. Arousing Bowman’s paranoia earned Texas Governor Panoblanco a cruise missile to the face, but NAUGA-Security has something more … nuclear … in mind for Cantrell and his pals out in Rosinante. William Marvin Hulvey has an incurable condition: he is tied by duty and chains of shared faith and history to the Contra Darwinists within the Forbes Administration. Too bad for him that he is one of the few competent Contra Darwinists. As the North American Union staggers towards civil war and dissolution, Hulvey does his best to preserve the union. When that fails, as his energetic but foolish compatriots ensure it will, he tries to salvage something, anything, from the wreckage. 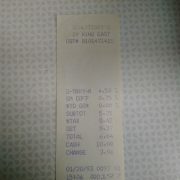 And the only price will be everything that he values. Charles Cantrell’s bold innovations haven’t just doomed the NAU to a well-earned extinction. By introducing a new mirror design and building lasers of Unusual Size, he transformed space colonies from valuable but vulnerable outposts to well-defended communities no longer in need of warships to protect them. That means, as a cabal of ambitious Japanese officers realize, those ships are now available for more glorious efforts. And with the NAU still caught up in civil war, who is to stop Japan from using this opportunity to collect for Japan all the shiniest treasures in the Solar System? Only a gang of engineers who never saw a diagram on a restaurant table cloth they could not turn into metal within weeks. Oh, and their allied artificial intelligences. And of course, the One True Faith. An educated reader could probably date when this was written from details like the importance of ozone depletion to the plot, the absence of anything like an internet, and the imagined history of the NAU. It would have seemed plausible if the Mexicans and Americans had petitioned to share Ottawa’s enlightened guidance. This was not the case. The unification was the result of 1) oil depletion and 2) WWIII-lite, thanks to a bumpy German reunification. such colonies are central to this novel. 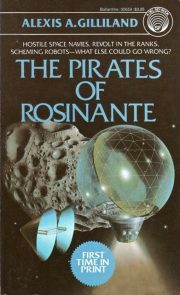 The mirrors on the NAU colony around Ceres (or rather, the fact that they are attached to the rotating colonies) hint that Gilliland was inspired by a design from the early 1970s; the design of colony Rosinante seems to date from slightly later, after the problems inherent in attaching the mirrors to the habitat were pointed out. Gilliland’s nuclear space craft are charmingly underpowered by SFnal standards, probably because Gilliland educated himself about plausible propulsion systems before writing his books. Other authors have their ships zoom around the Solar System at multiple gees. Gilliland’s crawl along at hundredths of a gee, if that. These are all very short books by modern standards (185, 181, and 216 pages respectively) and while they have a surprising amount of plot, they are not overburdened with much in the way of character development. The characters are at least distinguishable from each other, but (with one major exception) they don’t change much over the course of the trilogy. On a related note, if you want to know why the battalion of Korean-Japanese (or occasionally, oriental) women agree to marry young Anglo Texans whom they have never met, and vice versa, I am afraid you will be disappointed. I can tell you from experience that getting married at twenty-one offers many interesting learning opportunities, but these books don’t explore them (even Cantrell’s marriage gets back-burnered pretty quickly, in a way that explains his track record of divorce 4). The marriages are essential to the plot, however, because the colony has to recruit a doctor who is experienced in prenatal care—an acquisition that does not work out precisely as planned. There have been quite a few stories about space colonies and the steely-eyed engineers who build them, but this was the first one I had ever encountered that took advantage of the obvious possibility that the same irrational exuberance seen in the South Sea venture or the Mississippi Scheme could apply to space colonies as well. 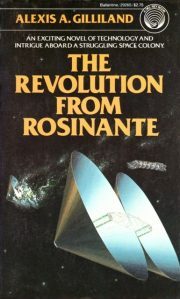 I was an economics student when I first encountered The Revolution from Rosinante , so the main premise of the plot (Q: “And how do these colonies make money?” A: “Actually, they don’t; everyone involved is kidding themselves”) was an interesting one. There are still all too few books that play with what I will call the Darien Colony potential of space colonies, so in that respect this trilogy stands out. For that matter, while SF novels where the gold standard is back are not uncommon (particularly back in the 1970s and early 1980s, when stagflation was a thing and libertarianism was not yet in the DSM), the way this book approaches the gold standard is unusual. Gilliland does a very funny thing with the gold standard in this trilogy. I won’t say what it is except that, while the specifics are particular to this book, the overall effects will be familiar to historians. And it is perfectly in keeping with Cantrell’s habit of solving immediate problems by creating much larger, longer term problems. These are surprising comic novels, given the backdrop of economic calamity, self-destructive militarism, and an unnecessary and avoidable civil war. Gilliland is careful to limit his focus: we see how the market collapse affects people like Cantrell 5; we are shown the occasional space battle … but the spectacle of thirty million people fleeing regions of the NAU now hostile to people of their ethnicity are left to the imagination. Probably just as well, because it would take all the fun out of watching the avalanche to know there are people under it. On rereading these after twenty odd years, the book that stands out is the second one, because of the focus on antagonist Hulvey. Cantrell and his chums are a familiar collection of characters; you may not have encountered these particular guys, but you’ve encountered characters a lot like them, in books like Venus Equilateral and a zillion Analog stories. They are cheerfully confident engineers, entrepreneurs, and artificial intelligences, who are sure to win out in the end. Because reasons. William Hulvey, on the other hand, is a tragic figure who does bad things from the highest motivations and who pays a terrible price in the end. And I think he can see where it is all going to end long before that end arrives. But if he is to be true to his ideals, he cannot alter his path. 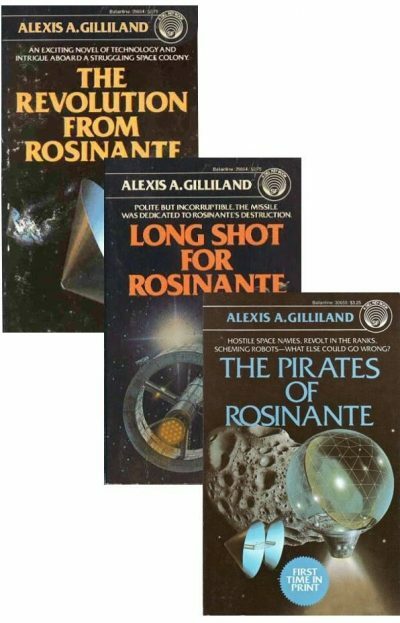 Gilliland’s career as a speculative fiction author was a short one: seven novels, (two trilogies and a standalone), all published between 1981 and 1992. I know for a fact that he was trying to sell another novel in the 1990s, without any luck. I know because I heard him read from it. He had also finished a short story that is, as far as I know, unpublished as well. My guess is that he was one of the victims of the death of the mid-list in the 1990s (and more specifically, the death of Del Rey’s mid-list after the passing of its founding editors). Now we live in a glorious age when even fairly obscure books can live again as ebooks and the three books of the Rosinante Trilogy are in print again, in electronic form. I own and have read books by all of these folks. Nyah nyah. Of them all, Stallman may be most obscure. That’s because Stallman died before his career had really begun, just five months after his debut novel, The Orphan , was published. The two sequels, The Captive (1981) and The Beast (1982), were published posthumously. And a short story from 1971 but I don’t think that counted as a professional sale. I know when I read them last because I found this little treasure between the pages of the third. There’s the interesting detail mentioned in passing that Cantrell used his first wife’s money to create himself a nice company to run. This did not go entirely well; his company ended up purchased by a larger, more successful concern and I don’t think his wife got her money back. I also found it an interesting detail that while the implosion of the space colony market bubble is catastrophic to some banks and completely changes the course of Cantrell’s life, it’s a non-event to the average person on Earth.